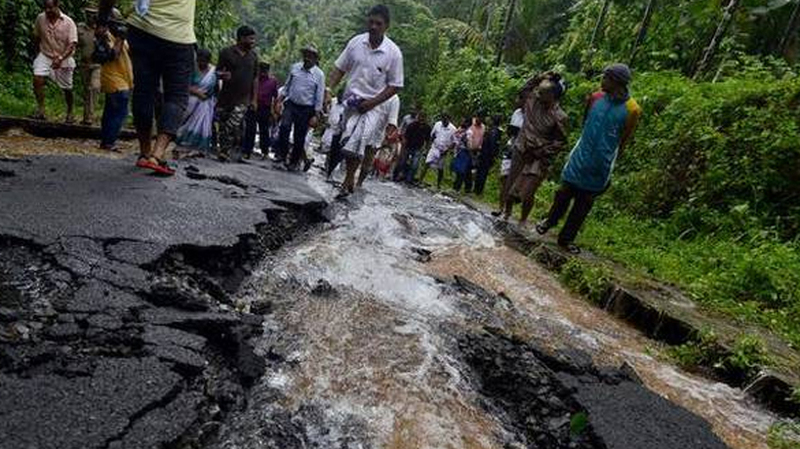 Kochi: South West monsoon continues to wreak havoc in the State with landslides already claiming four lives in Thamarassery in Kozhikode on Thursday morning. Several areas in the hilly districts such as Kozhikode, Malappuram, Wayanad, Palakkad and Thrissur and low-lying regions in Alappuzha have been receiving continuous downpour. Three children died in landslip in Thamarassery and were identified as Dilna, 9, her brother Mohammed Shahanas, their seven-year-old neighbour in the landslip in Thamarassery. Eight persons are missing from the region located on the foothills of the Western Ghats. Nine houses were washed away in the heavy rain in the area. Traffic through Wayanad passage was disrupted due to inundation and land slips. The road is mainly used to travel to different parts of Karnataka. Two women trapped under heap of earth in Waynad were rescued by locals and fire service personnel. Kakkayam, Mankayam, Pulloorapara, Eengapara, Kattipara are the areas worst affected areas in Kozhikode district. A 50-member battalion of NDRF has moved to the affected areas in northern region. Large area under cultivation in Edavanna in Malappuram district was destroyed. Crop loss, inundation and land slips have been reported from across the State. One person was injured in a landslip in Lakkidi in Palakkad district. Meanwhile, Revenue Minister E Chandrashekharan and senior officials are camping in Kozhikode to monitor the situation. Manjeri in north Kerala recorded rainfall of 24 cm, Nilambur 21 and Karipur 20. Heavy rain has been predicted across Kerala for the next 48 hours. Many rivers are overflowing and shutters of small dams, including Peringalkoothu and Karapuzha, have been opened. Minister Chandrashekharan told reporters that he had held discussions with Chief Minister Pinarayi Vijayan in this regard and said that if needed help would be sought from Tamil Nadu to reinforce NDRF. Meanwhile, Jose K Mani, MP, requested Prime minister and the Union Home Minister to give Central help to families marooned in Kottayam and Alappuzha. The Chief Secretary has directed District Collectors to take all precautionary measures.